How new technologies (including Artificial Intelligence & Virtual Reality) help PR professionals & journalists with effective story telling and reaching audiences. 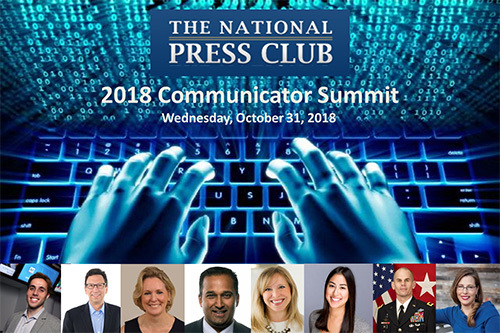 On Wednesday, October 31, the National Press Club will host its annual Communicators’ Summit in the National Press Club, Ballroom -- located at 529 14th Street, NW -- 13th floor. This year's program will address new technologies (including Artificial Intelligence and Virtual Reality) that can help public relations professionals and journalists with effective story telling and reaching audiences. At the same time, because technology has opened doors for consumers to get news and information via numerous platforms, communicators need to reach them not just by those platforms, but by using inter-generational -- even multicultural language that resonates and engages towards some action -- to buy a product, to vote a particular way, support a POV or even just to inform or educate. 8:35-9:35 a.m. -- Francesco Marconi, R&D Chief, The Wall Street Journal, will discuss how Artificial Intelligence is delivering new tools that advance the work of journalists and communicators. 9:45-11:00 a.m. -- Session I: Understanding Generational Communications -- from Millennials, GEN-Y Z, GEN-Y. How to understand these generations from a communicator and journalist POV and how to reach them with messaging in order to influence and drive change, AND how to work and communicate with these people in the most effective way. 11:15 a.m.-12:30 p.m. -- Session II: How media organizations are using different technologies and re-purposing news content to reach readers across various audiences (be they generational, multi-cultural, etc) and how can communicators help journalists and media organizations make their jobs easier knowing that content is edited to fit various audiences? 12:30-1:45 p.m.-- Lunch/Luncheon Speaker: Frank Sesno, Director of the School of Media and Public Affairs at George Washington University. Sesno will discuss challenges and opportunities, along with take-aways and lessons for today’s communicators – not just how to use innovation get one's message out to key audiences (via various platforms), but also what are some issues (be they technological, generational, or even political) that get in the way of good communications. Moderated by Andrea Edney, President of the National Press Club. Tickets are $75 for Wharton Club members and guests.